A relay is an electrically operated switch. Current flowing through the coil of the relay creates a magnetic field which attracts a lever and changes the switch contacts. The coil current can be on or off so relays have two switch positions and they are double throw (changeover) switches. Relays allow one circuit to switch a second circuit which can be completely separate from the first. For example a low voltage battery circuit can use a relay to switch a 230V AC mains circuit. There is no electrical connection inside the relay between the two circuits, the link is magnetic and mechanical. The supplier's catalogue should show you the relay's connections. The coil will be obvious and it may be connected either way round. Relay coils produce brief high voltage 'spikes' when they are switched off and this can destroy transistors and ICs in the circuit. To prevent damage you must connect a protection diode across the relay coil. 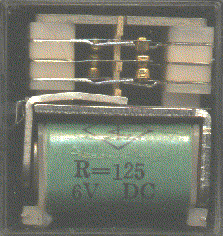 The animated picture shows a working relay with its coil and switch contacts. You can see a lever on the left being attracted by magnetism when the coil is switched on. This lever moves the switch contacts. There is one set of contacts (SPDT) in the foreground and another behind them, making the relay DPDT. COM = Common, always connect to this, it is the moving part of the switch. Connect to COM and NO if you want the switched circuit to be on when the relay coil is on. Connect to COM and NC if you want the switched circuit to be on when the relay coil is off. If you are choosing a relay for an existing PCB you will need to ensure that its dimensions and pin arrangement are suitable. You should find this information in the supplier's catalogue. The relay's coil voltage rating and resistance must suit the circuit powering the relay coil. Many relays have a coil rated for a 12V supply but 5V and 24V relays are also readily available. Some relays operate perfectly well with a supply voltage which is a little lower than their rated value. For example: A 12V supply relay with a coil resistance of 400 passes a current of 30mA. This is OK for a 555 timer IC (maximum output current 200mA), but it is too much for most ICs and they will require a transistor to amplify the current. The relay's switch contacts must be suitable for the circuit they are to control. You will need to check the voltage and current ratings. Note that the voltage rating is usually higher for AC, for example: "5A at 24V DC or 125V AC". Most relays are SPDT or DPDT which are often described as "single pole changeover" (SPCO) or "double pole changeover" (DPCO). Transistors and ICs (chips) must be protected from the brief high voltage 'spike' produced when the relay coil is switched off. The diagram shows how a signal diode (eg 1N4148) is connected across the relay coil to provide this protection. Note that the diode is connected 'backwards' so that it will normally not conduct. Conduction only occurs when the relay coil is switched off, at this moment current tries to continue flowing through the coil and it is harmlessly diverted through the diode. Without the diode no current could flow and the coil would produce a damaging high voltage 'spike' in its attempt to keep the current flowing. Reed relays consist of a coil surrounding a reed switch. Reed switches are normally operated with a magnet, but in a reed relay current flows through the coil to create a magnetic field and close the reed switch. Reed relays generally have higher coil resistances than standard relays (1000 for example) and a wide range of supply voltages (9-20V for example). They are capable of switching much more rapidly than standard relays, up to several hundred times per second; but they can only switch low currents (500mA maximum for example). Relays require more current than many chips can provide, so a low power transistor may be needed to switch the current for the relay's coil.